By the time a man earns seven Purple Hearts and lives to talk about it, he could either be described as one of the luckiest men alive or perhaps just one of the bravest. At the very least this is a person who has proven he won’t quit even under the direst circumstances – even when those circumstances include being shot in the neck. Such is the case of Matt Louis Urban, or as he was more appropriately known: “The Ghost.” By the time World War 2 ended, the Ghost would be awarded the Medal of Honor along with seven purple hearts, two Silver Stars, three Bronze Stars with a V, and a number of other honors making him one of the most highly decorated soldiers of the war. For Urban, it seemed he did his best fighting when wounded and with each Purple Heart, one could always expect to find an act of inexplicable gallantry to follow. Matt Urban was born August 25, 1919, in Buffalo, New York to an immigrant Polish Catholic family. After High School, he would go on to attend University at Cornell where he ran track and proved an accomplished boxer along with joining the ROTC. He joined the regular Army in 1941 and went on to receive a 2nd Lieutenant Commission before serving in seven Campaigns in the coming war and rising to the rank of Lieutenant Colonel. While his story before the war it not unlike most men of that era, it was his ability to take a hit and then keep on fighting that would distinguish him. 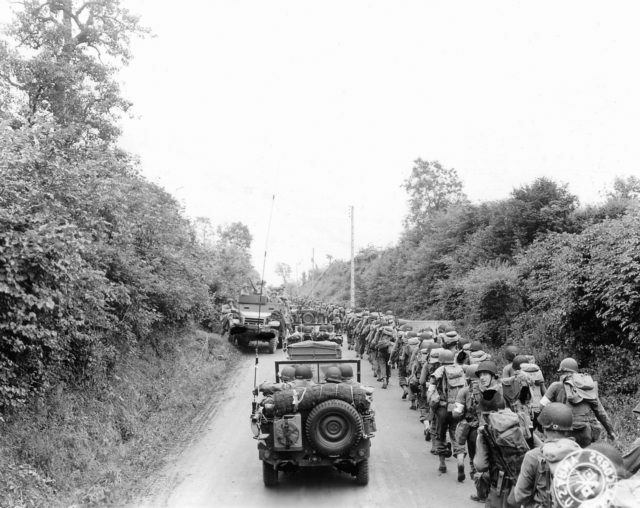 US Army soldiers and jeeps on their way to the front lines, Saint-Lô, France, July 1944. Throughout the war, Urban would find himself wounded time and time again and yet would often have to be wrestled and dragged away from the fight by his own men – even after being severely wounded. Once he even left a hospital without permission and hitchhike back to France to join his men at the front. By the time Normandy rolled around, Urban would already find himself wounded by shrapnel from his time in Africa and the subject of several gallant actions worthy of accommodation. In Tunisia, he sparked a counterattack against all the odds when the Germans attacked, and his unit began to retreat. He continued to press the attack and rushed a German with only his trench knife, stabbing him to death. After that, he grabbed the German’s gun and sent their own ammo back at the charging Germans with a devastating effect. As the Germans mounted a counterattack, Urban was wounded and would reluctantly earn the first of his many Purple Hearts. But Urban wasn’t sent home and was ordered to aid in the effort to invade Normandy. Between the 14th of June, 1944 to the first week of September, Urban would prove his North Africa heroics were just the opening act. 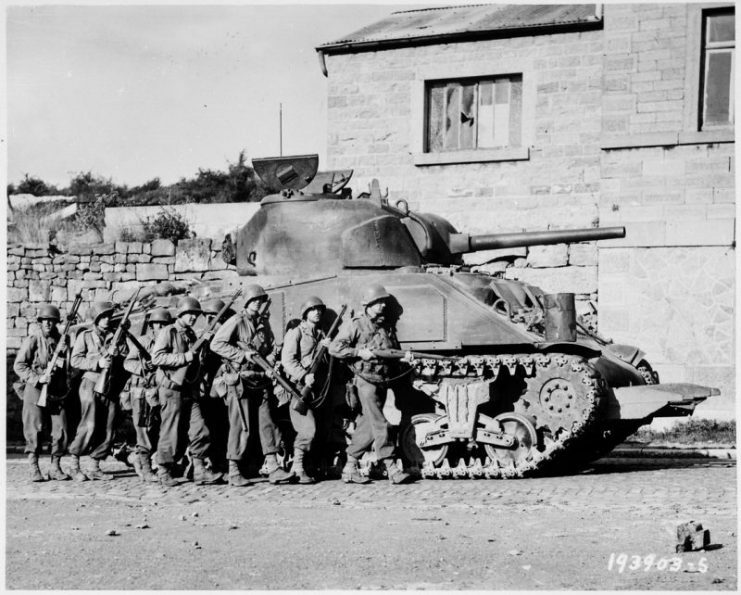 Assigned to the 2nd Battalion, 60th Infantry Regiment, 9th Infantry Division on June 14th he and his company were near Renouf, France when the company came under an intense barrage of tank and small arms fire. They immediately began taking heavy casualties from the relentless and withering tank fire, and Urban knew he had to take action if his men were to survive. 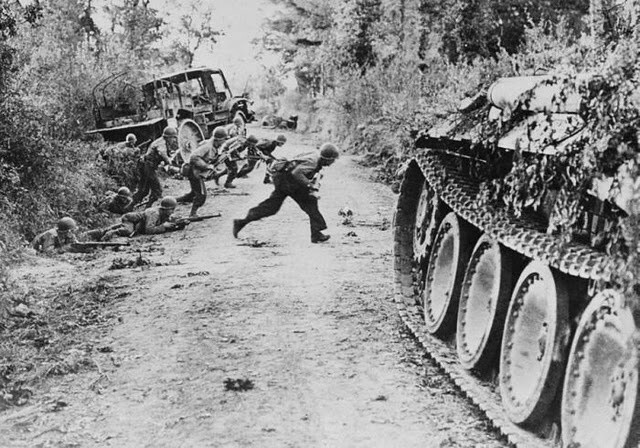 He grabbed a nearby bazooka and a man to carry the bazooka rounds, and together they charged through the hedgerows to find the enemy tanks raining destruction down upon their friends. Urban and his ammo carrier managed to avoid taking any hits from the small-arms fire and eventually found the two tanks firing on the other men. Urban took careful aim at the first tank, then blasted it. He then reloaded and carefully aligned the sights before sending the round toward the enemy. This knocked the second tank out. The company then surged forward and drove off the remaining enemy soldiers. The day’s heroics weren’t over for Urban and his men. Near Orglandes, France a few miles away, Urban was leading his men forward when they came under fire from a 37 mm tank gun. Urban was hit, but as the men moved to evacuate him, he physically fought them off and went on to lead his men to set up defenses to secure their position for the night. It became clear through the night that he was badly wounded and in need of evacuation but still Urban refused to relent. Despite the obvious wounds, the next day he led his Company in an attack where he was again hit. Seriously wounded his men got help, and he was evacuated to England for the time being. A month later Urban was still recovering from his wounds when word arrived that the unit was being devastated in the hedgerow fighting in Normandy. Urban was not the type of man to lie on a cot while his men took fire and checked himself out of the hospital. He hitched rides all the way back to the front at St. Lo, France and there he found that his men had just departed for the opening stages of Operation Cobra. Despite a serious limp which slowed him down, Urban raced ahead to reclaim command of his company. Once he made it, he found the attack was stalled and in serious danger of faltering. Two of his support tanks had been destroyed, and the third was operational but with no gunner, and no tank commander, it was useless and going nowhere. So Urban rounded up a lieutenant and sergeant and ordered them to take over the tank and use it to take out the enemy defense. Both men ran to the tank and scaled it, but the Nazis were waiting and opened up, killing the two before they could get in the tank. Urban once again took immediate action. Though crippled by his leg wound he charged toward the tank, totally disregarding his own safety. Injured, and fully aware of the enemy accuracy, he threw himself into the fire, climbed the tank and took over the machine gun turret. There he sent scathing fire back at the enemy position with such a devastating effect that his men counterattacked and destroyed the Nazi positions. Later in August, Urban was wounded twice more and once in the chest by shrapnel. Still suffering from all his prior wounds, that didn’t stop him from taking over command of 2nd Battalion. Even though he was in a command position and in no expectation to be on the front lines, Urban was not willing to sit out a fight. In early September, at the Meuse River close to Heer, Belgium, Urban personally led a charge against Nazi small-arm positions, mortars and artillery. In open terrain, he was struck in the neck by enemy fire. After the shock had subsided, he realized he couldn’t speak above a whisper and must have finally known he was dangerously close to death. Once more he would not let his men take him out of the battle until he was sure the US forces had beaten back the Germans and took the Meuse River Crossing. With success ensured and bleeding heavily from the neck, Urban finally relented to leave the fight. In 1944, Major Max Wolf filed a report recommending Urban for the Medal of Honor. However, when Major Wolf was killed in action, the report was misfiled lost to time until 1979. 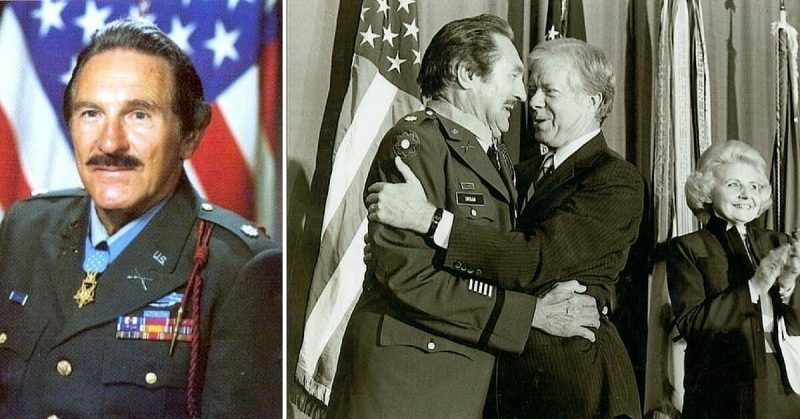 When an inquiry was made why his actions didn’t warrant the Medal of Honor, the missing report was found, and the Army finally finished the paperwork. 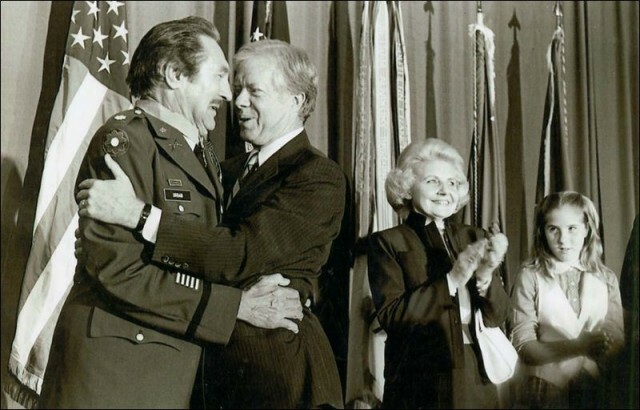 In 1979 he received the Medal of Honor from President Jimmy Carter and the long overdue thanks of a grateful nation. The man who likely should not have survived the war continued to press on until he passed away in 1995 from a collapsed lung.